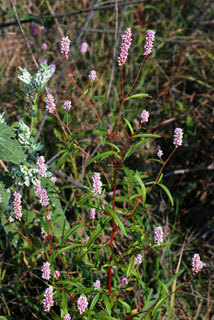 Persicaria bicornis (Raf. ) Nieuw. Stems: Ascending to erect, rarely decumbent, branched, glabrous or appressed- to spreading-pubescent above, usually stipitate-glandular. Leaves: Mostly cauline, alternate: ocrea brown, cylindric, 1/4 to 4/5 inch, papery, base inflated, margins truncate, eciliate or ciliate with bristles to 1/25 inch, surface glabrous or scabrous proximally, eglandular; petiole 1/25 to 4/5 inch; blade sometimes with dark triangular blotch on upper surface, linear-lanceolate to ovate-lanceolate, 1 to 7 inches long, .2 to 1 inch wide, base tapered to wedge-shaped, margins antrorsely scabrous, tip acute to acuminate, surfaces glabrous or appressed-pubescent along midveins, lower surface glandular-punctate. Inflorescences: Terminal and axillary, erect, spike-like, uninterrupted, .33 to 2.4 inches long, .4 to .7 inch wide; peduncle .33 to 2.8 inches, glabrous or pubescent, usually stipitate-glandular; ocreolae overlapping, margins eciliate or ciliate with short bristles. Flowers: Pedicels ascending, .06 to .2 inch. Flowers 2-11 per fascicle; perianth pink, glabrous, not glandular-punctate; tepals 5, obovate to elliptic, 1/8 to 1/5 inch, veins prominent, not anchor-shaped; stamens 6-8, included or exserted; styles 2(-3), deciduous, included or exserted. Fruits: Achenes, dark brown to black, discoid or rarely 3-angled, 1/12 to 1/8 inch, glabrous, 1 side usually with central hump. Habitat: Moist disturbed places, stream and pond margins, prairie ravines, ditches. Comments: Persicaria, pertaining to peach, alluding to the resemblance of the leaves of some species to those of the peach and bicornis, 2-horned, alluding to the two styles.